The 30.48 metre motor yacht Nicole Evelyn, listed for sale by Joe Marino at Atlantic Yacht & Ship, has been sold with Bob Cury at RJC Yachts introducing the buyer. Built in GRP by US yard Hatteras to a design by Jack Hargrave, Nicole Evelyn was delivered in 2002 and has been consistently well maintained since. Her interior features cherry wood panelling with marble and onyx detailing throughout. She accommodates eight guests in four cabins consisting of a full-beam master suite, VIP suite, double to port and a convertible twin to starboard, all with flatscreen televisions and en-suite bathroom facilities. The large saloon features a plush sofa, custom made coffee table, two end tables and three additional leather chairs. Entertainment amenities include a 46-inch Toshiba flatscreen television, stereo/CD sound equipment and there is a sunken granite-topped wet bar with an ice maker and fridge. Forward of the lounge area is a formal dining area which includes a large custom teak inlaid dining table and eight matching chairs. Further forward still is a well equipped country kitchen style galley fitted with a breakfast bar and dinette for casual breakfasts and snacks. The rich look of cherry wood continues in the pilothouse with wood plank flooring and wood cabinetry, and includes an L-shaped lounge with table. The flybridge is an ideal area for al fresco entertaining and dining, offering two L-shaped settees, a Gaggenau four burner grill, fridge and ice maker. A comfortable cruising speed of 18 knots comes courtesy of twin 1,800hp MTU engines. 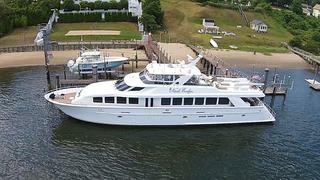 Nicole Evelyn was asking $3,249,000 and will be renamed Vesper.